Why is AD account lockout troubleshooting important? Since Active Directory is the backbone of your organization, you need AD troubleshooting tools always at hand to facilitate incident recovery. Tools for Active Directory account lockout troubleshooting are no exception. It is essential that users always have access to the resources they need and critical business processes are not disrupted. Several Active Directory troubleshooting tools are available to help with locked accounts. 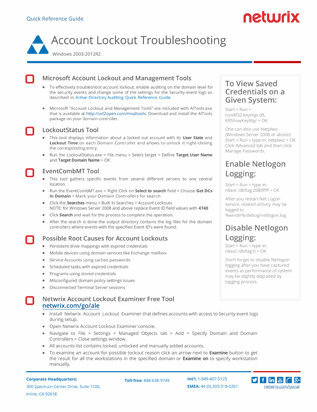 LockoutStatus and EventCombMT are two tools developed by Microsoft specifically for AD account lockout troubleshooting. This guide gives you step-by-step instructions for using these tools to find a locked account, unlock it and determine the reason behind the lockout. Additionally, the guide lists common root causes of account lockouts, for your reference.